Emerald Media - Getting the show on the road - MAC Aviation Aircraft explains band tour logistics. Getting the show on the road - MAC Aviation Aircraft explains band tour logistics. Charter companies are just like swans, above the surface clients perceive smooth, uncomplicated operations, yet beneath the surface feet are paddling with controlled fervor. Each individual charter comes with its own set of challenges and "what-if" scenarios. A multi-destination dedicated charter will probably require a few more stages in the process. A good charter company will make any charter look uncomplicated - it's a talent. When it comes to managing the needs of a band on tour, the operator enters a different logistical league. According to Ryan Clyde, Director of Operations for Maine Aviation Aircraft Charter, a MAC Air Group subsidiary, who regularly manages band-tour charters it's an elaborate choreography that requires high levels of communication, timing and understanding. Primary communication is with the aviation broker that books the trip, then, in-flight liaison is with either the tour, or band manager, both of which travel on the aircraft. Developing relationships with both parties is essential if the multi-city charter is to be successful. "We are aware of this in advance and do our best to develop a business-style relationship to improve communication and build trust in a number of different ways," says Clyde stressing the importance of the three key relationships. The first is with the dispatch department, which sources high-level planning information, passenger names and the necessary international documentation such as visas. Secondly it's important to have a good relationship with the flight crew as they effectively control when the passengers and accompanying luggage will arrive and depart. Thirdly, and possibly one of the most important relationships is with the Flight Attendant, as they probably interact the most with the passengers. Combined these relationships help the operator better anticipate any issues that may arise. After communication comes timing, it can make or break a tour. Flights will generally need to arrive at mid-day for an evening show. Any delay to this can interfere with sounds checks, warm-ups or even the show itself. Departures are often sometime after midnight, in which case the band members and staff are exhausted and only interested in eating, resting and arriving at the next city as quickly as possible. Pre-flight, in-flight and post-flight duties routinely occur between midnight and four or five in the morning. Timelines are typically very tight, so it's a must to continuously review international permit requirements, customs arrangements and handling services. While errors on these items would not be considered acceptable on any charter flight, the negative affect is compounded on a band-tour charter. Band tours consist of a team living, working and travelling in close proximity with each other. 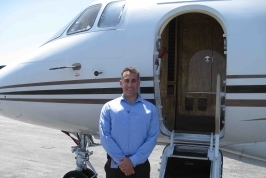 "We understand the need to have a relaxed cabin environment and typically use our Challenger 850 aircraft. Even with sixteen passengers, the cabin is spacious and holds plenty of luggage; both of which are critical components when a band is choosing an operator or aircraft type. Providing in-flight service for 12-16 people can be very demanding. Flights are typically of short duration (45 minutes is not uncommon). Serving full dinner, using the limited facilities, for that many people, in that short amount of time, takes a special type of talent and superior planning. Understanding the needs and desires of the passengers is critically important. Anticipating maintenance schedules is also imperative. Major scheduled maintenance should be conducted prior to the beginning of the trip. Clyde says that, "smaller inspections and emergency maintenance in the United States are relatively easy to arrange, but internationally it can be a challenge." Again he advocates preparation and planning. "We typically make contact with FAA certificated A&P technicians in advance of an international trip so minor scheduled inspections or emergency maintenance can be handled with minimal impact. Pro-activity is a byword in maintenance planning for band-tour charters." MAC Air Group uses an internationally recognized Safety Management System to proactively anticipate risk. "Enhancing safety underpins our strict approach to standardisation and cockpit resource management, safety and standardisation are considered as a matter of first priority. Back to the swan, 90% of the band tour work is never seen by a client or discussed with a passenger. However, it is that portion of the work, completed by the committed team at MAC Air Group, which has created the opportunity for the US-based company to compete for these special band-tour charters, and has positioned the company as a reliable, trusted provider.